Light and understated was never the personality of this loft—or its owner—says interior designer Gina Sims, who amped up this plain kitchen with layers of bold features. 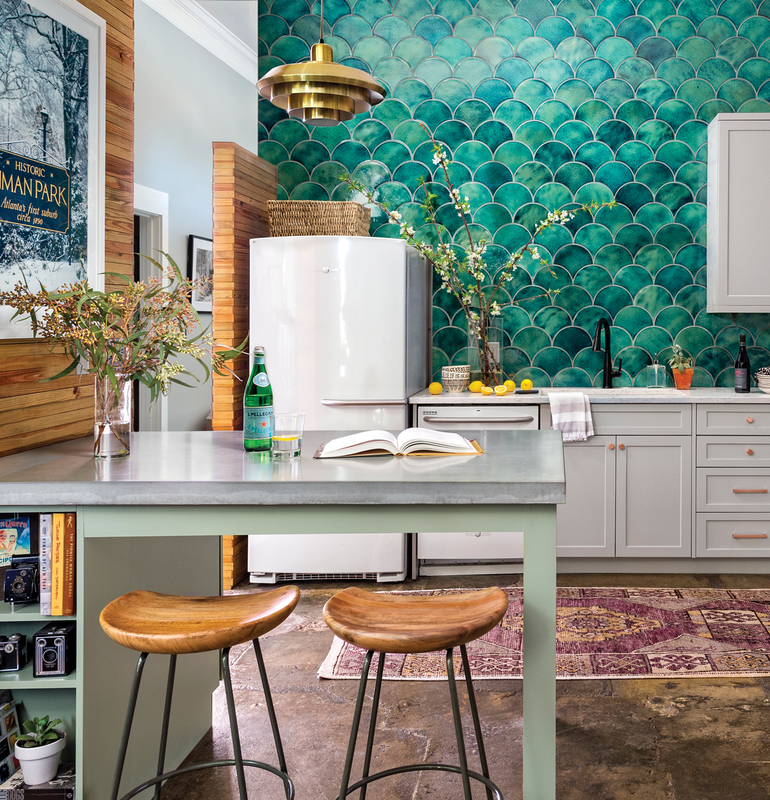 Homeowner Cati Teague specified “awesome and green,” which sent Sims on a hunt for the perfect backsplash tile. Sims mixed new cabinetry by Dove Studio in Folkstone Gray on the perimeter with light green on the peninsula, which is crowned by a concrete countertop. Concrete floors, which Sims covered with a purple runner, contribute an offbeat patina. “Shopping for vintage rugs is like candy to me,” says the designer. Two room dividers glow with warm wood. Sims continued the feel with wooden stools from West Elm. The snowy photograph of Inman Park is by Teague, a professional photographer, and is a bestseller on her Etsy site. After searching tile shops from Atlanta to Nashville, the designer settled on “Water Lily” by Seneca Tiles. “Each tile is handmade and has incredible movement,” says Sims. Eleven-foot-tall ceilings can accommodate the large-scale pattern. Go funky with kitchen accessories. “I love quirky pieces that tell the story of the client,” says Sims, who incorporated vintage cameras in the open shelves. The Art Deco light fixture and copper cabinet hardware reference the historic neighborhood.